A lot of smaller hotels or bed and breakfasts feel that they simply can't afford to make the jump to an automated system. They feel their needs just don't meet the sophisticated and very expensive software reservation systems on the market. That is not true. 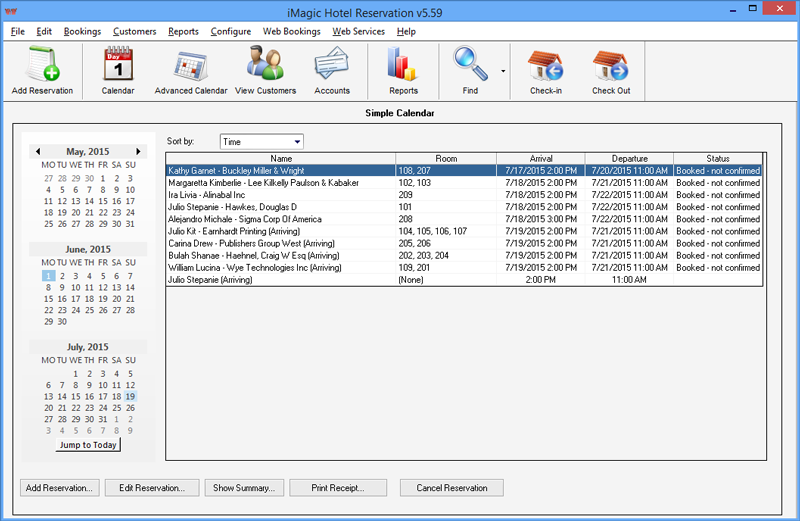 iMagic Reservation software is a fully automated program that you can customize to help you manage your business and gain repeat customers without a too complex system that only a tech support genius can understand. The program lets you make important notes about your guests such as recording food allergies, make notes of special events like birthdays or anniversaries, you can keep notes of any nicknames and customer preferences so your guests will feel special every time they walk through your door. It is fast and easy to create your bookings too. The program will walk you through the process and it can be done in just a few simple steps. The program will update the available rooms in your building and there is no need to worry about any mistakes as the program takes you through every step from the initial booking dates to the final confirmation. There has never been such a simple program for small business owners at a great price. As a hotel owner, you need to keep track of the travel industry and keep ahead of the trends. iMagic Hotel Reservation helps you see the big picture and plan your long-term goals accordingly. You will keep track of your busy periods and the times when the bookings are slower. It is easy to plan your staff and services when you know what to expect in the future. Download the free Trial Edition today and take a look at what iMagic Hotel Reservation can do for you! Recent Changes: October 2018 update for hotel management and reservations, add Business Rules to automate your business and increase repeat business. iMagic Hotel Reservation - hotel management creating guest connections through technology.